The Great Lakes and the East African coastline as seen from space. The Indian Ocean can be seen to the right. 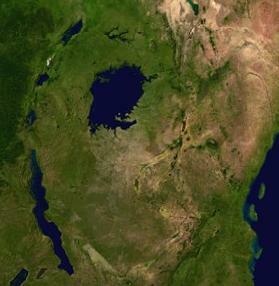 The Great Lakes of Africa are a series of lakes in and around the Great Rift Valley. They include Lake Victoria, the second largest freshwater lake in the world in terms of surface area, and Lake Tanganyika, the world's second largest in volume as well as the second deepest. Despite their beauty, the Great Lakes also rank as one of the world's most endangered water systems. The term "Great Lakes" in the African context is a rather loose one. Unlike their North American counterparts, the three largest lakes have a host of middle-sized and small lakes nearby, though the small ones would be considered very substantial in many countries of the world. There is no accepted size criterion for "Great Lake." Contrary to early European explorers' assumptions that one lake was the source of the Nile River, it is now accepted that glaciers in the Ruwezori Mountains and more than one lake and river feed the Nile's waters. Burundi claims to be the site of the springs that flow into the Kagera River, the largest of the several rivers that feed into Lake Victoria before the water exits the lake at Ripon Falls as the Victoria Nile. But a smaller system of rivers drains the Virungas and Ruwenzori mountains and the land between them and empties into Lake Albert, where the water joins with the Victoria Nile and then flows north as the White Nile. Lake Victoria (68,800 square kilometers; elevation 1,133 meters) is the continent's largest lake, the largest tropical lake in the world, and the second largest freshwater lake in the world in terms of surface area. Lake Turkana (6,405 square kilometers; elevation 360 meters) is the world's largest permanent desert lake and the world's largest alkaline lake. By volume it is the world's fourth largest salt lake. Some call only Lake Victoria, Lake Albert, and Lake Edward the Great Lakes as they are the only three that empty into the White Nile, which feeds into the Nile River. Lake Kyoga is part of the Great Lakes system but is not itself considered a Great Lake, based on its size. Lake Tanganyika and Lake Kivu both empty into the Congo River system, while Lake Malawi is drained by the Shire River into the Zambezi. Lake Turkana has no outlet. Two other lakes close to Lake Tanganyika do not appear on the lists despite being larger than Edward and Kivu: Lake Rukwa and Lake Mweru. Because the term is a loose one, it is often preferable to use other categorizations such as "African Rift Valley Lakes" or "East African Lakes." The lakes of the Western, or Albertine Rift, together with Lake Victoria, include the largest, deepest, and oldest of the Rift Valley lakes. The highlands are relatively cool, with average temperatures in the mid-60s (Fahrenheit) and abundant rainfall. Major drainage basins include those of the Congo-Zaire, Nile, and Zambezi rivers, which drain into the Atlantic Ocean, Mediterranean Sea, and Indian Ocean, respectively. Forests are dominant in the lowlands of the Congo-Zaire Basin, while grasslands and savannas are most common in the southern and eastern highlands. Temperatures in the lowlands average a hot mid-90s (Fahrenheit). Around Lake Turkana, the climate is hot and very dry. A short rainy season in October is followed by a longer one from April to May. The Western Rift Valley lakes are freshwater and home to an extraordinary number of endemic species. Approximately 1,500 cichlid fish species live in the lakes, as well as other fish families. (Cichlids are perch-like fishes that occur only in tropical and subtropical freshwaters. The family contains more species than any other fish family.) The lakes are also important habitats for a number of amphibian species. Crocodiles are numerous. Mammals include elephants, gorillas, and hippopotamus. The Lake Turkana region is home to hundreds of species of birds endemic to Kenya. The flamingo wades in its shallows. The East African rift system also serves as a flyway for migrating birds, bringing in hundreds more. The birds are essentially supported by plankton masses in the lake, which also feed the fish there. Vegetation ranges from rainforest to savanna grasses. In some lakes, rapidly growing invasive plants, like the surface-choking water hyacinth and shore-clogging papyrus, are problems. Water hyacinth have thus far affected only Lake Victoria. Until 12 million years ago, the bountiful waters of the equatorial plateau either flowed west into the Congo River system or east to the Indian Ocean. Creation of the Great Rift Valley changed that. A rift is a weak place in Earth's crust due to the separation of two tectonic plates, often accompanied by a graben, or trough, in which lake water can collect. This rift began when East Africa, impelled by currents in the mantle, began separating from the rest of Africa, moving to the northeast. The basins that resulted from the geological uplifts filled with water that now flowed north. Lake Victoria is not actually within the Rift Valley; it occupies a depression between the Eastern and Western Rifts, formed by the uplift of the rifts to either side. Around two to three million years ago, Lake Turkana was larger and the area more fertile, making it a center for early hominids. Richard Leakey has led numerous anthropological digs in the area, which have led to many important discoveries of hominin remains. The two-million-year-old Skull 1470 was found in 1972. It was originally thought to be Homo habilis, but some anthropologists have assigned it to a new species, Homo rudolfensis, named after the lake (previously known as Lake Rudolf). In 1984, the Turkana Boy, a nearly complete skeleton of a Homo erectus boy was discovered. More recently, a 3,500,000-year-old skull was discovered there, named Kenyanthropus platyops, which means "The Flat-Faced Man of Kenya". The term Great Lakes region is, like Great Lakes itself, somewhat loose. It is used in a narrow sense for the area lying between northern Lake Tanganyika, western Lake Victoria, and lakes Kivu, Edward and Albert. This comprises Burundi, Rwanda, northeastern Democratic Republic of Congo, Uganda, and northwestern Kenya and Tanzania. It is used in a wider sense to extend to all of Kenya and Tanzania, but not usually as far south as Zambia, Malawi, and Mozambique nor as far north as Ethiopia, though these four countries border one of the Great Lakes. An estimated 107 million people live in the Great Lakes region. The area described in the narrow sense above is one of the most densely populated areas of Africa. Because of past volcanic activity, this area contains some of Africa's best farmland. Its altitude gives it a sub-tropical climate despite being right on the equator, becoming temperate in the mountains. This makes tropical diseases of humans and livestock, such as trypanosomiasis, less prevalent, so that, for instance, cattle and other susceptible animals thrive. These factors encouraged the growth of human population. This increased population is now competing for the habitat used by many endangered species, including the mountain gorilla and the forest elephant. Governments in the region are attempting to lessen the impact through integrated conservation and development projects. Because of the density of population and the agricultural surplus in the region, the area became highly organized into a number of small states. The most powerful of these monarchies were Rwanda, Burundi, Buganda, and Bunyoro. Unusually for sub-Saharan Africa, the traditional borders were largely maintained by the colonial powers. Around Lake Turkana, in the eastern branch of the rift, in contrast, desert-like conditions prevail. The area is sparsely inhabited by nomadic pastoralists raising camels, sheep, and goats. Being the much-sought-after source of the Nile River, the region had long been of interest to Europeans. The first to arrive in the region in any numbers were missionaries, who had limited success in converting the locals but did open the region to later colonization. The increased contact with the rest of the world led to a series of devastating epidemics affecting both humans and livestock. These decreased the region's population dramatically, by up to 60 percent in some areas. The region did not return to its precolonial population until the 1950s. While seen as a region with great potential after independence, the region has in recent decades been marred by civil war and conflict, from which only Kenya and Tanzania have largely escaped. The worst affected areas have been left in great poverty. Burundi, Rwanda, and the DRC have relaunched the Economic Community of the Great Lakes Countries (CEPGL), which was created in 1976 but had been inactive because of strife in the region. Their goal is to facilitate cooperation and resolve conflict in the Great Lakes, with particular attention to the problem of armed groups operating in eastern Congo. One group, the so-called "rasta" rebels, is made up largely of former Rwandan rebels who have been active in the remote mountains and forests of the eastern DRC since the Hutu-led genocide of minority Tutsis in Rwanda in 1994. The CEPGL will permit the free movement of people and goods, and there are plans to create a regional bank and an institute for agricultural research. More than 3.5 million people have died as a result of conflict in the eastern DRC. Although conditions have improved, there are continuing incidents of violence in the area and the situation remains volatile. In 2007, the DRC agreed to step up its offensive against the rebels but ruled out intervention by foreign troops. Fishing—primarily of tilapia species but also of Nile perch—provides the main livelihood. 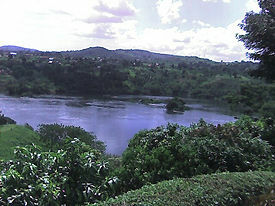 With four Great Lakes on its borders, Uganda ranks as one of the world's largest producers of freshwater fish. The climate and rich volcanic soils in the highlands sustain intensely cultivated croplands. The economies of the Great Lakes region states have different structures and are at various stages of development. The GDP real growth rate ranges from 5.1 percent in Burundi to 6.4 in DRC. GDP per capita fluctuates between $700 in DRC and Burundi and $1,900 in Uganda. 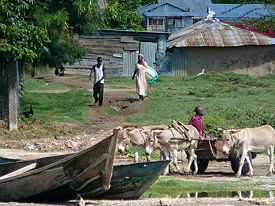 Daily life on Rusinga Island, Lake Victoria, Kenya, 2007. The East African Community (EAC), which had been dissolved in 1977 due to political and economic differences among Kenya, Tanzania, and Uganda, was revived in 1999. The new regional organization also includes Burundi and Rwanda. Its headquarters are located in Arusha, Tanzania. Under the auspices of the EAC treaty signed in 1999, the members are negotiating the framework for a customs union, with a view of establishing a common regional market. Officials also envisage a monetary and political union in a process they say could take up to 20 years. The region's principal exports are mainly agricultural products. These include horticulture, tea, coffee, cotton, tobacco, pyrethrum, fish, and hides and skins. Other exports include handicrafts and minerals such as gold, diamonds, gemstones, soda ash, and limestone. Tourism is also one of the major sources of foreign exchange. The region's major imports are machinery and other capital equipment, industrial supplies and raw materials, motor vehicles and motor vehicle parts, fertilizer, and petroleum products. The major trading partners of the region are the European Union, Japan, China, India, United Arab Emirates, and Saudi Arabia. The regional cooperation and integration envisaged in the EAC is broad based, covering trade, investments and industrial development; monetary and fiscal affairs; infrastructure and services; human resources, science and technology; agriculture and food security; environment and natural resources management; tourism and wildlife management; and health, social, and cultural activities. Other areas of cooperation include free movement of factors of production and cooperation in political matters, including defense, security, foreign, legal, and judicial affairs. Representatives of Rwanda, Burundi, and DRC met in Brussels in 2004 to revive the Economic Community of the Great Lakes Countries. Their plans entail boosting key shared institutions such as the Great Lakes Development Bank, the Institute of Agronomic and Zootechnic Research, the International Electricity Company for the Great Lakes Countries. The sectors that could underpin regional integration include infrastructure, transport, communications, banking, energy, and agriculture. The relaunch program included a budget for the first year of $970,000, financed primarily by Belgium and the European Union. The organization will permit the free movement of people and goods within the region. Burundi, Kenya, Rwanda and Uganda are also members of the Community of East and Southern African States (COMESA), formed in 1994 and composed of 20 countries. Tanzania withdrew in 2000, citing a high trade imbalance with COMESA-member countries, particularly Kenya. In October 2000, COMESA launched its free trade program, creating schedules for internal tariff reductions. By the end of 2004, COMESA aims to have a common external tariff structure for all third party trade, among other regional and cooperative goals. All links retrieved July 31, 2017.
International Association for Great Lakes Research. May 29, 2007. Special Issue of JGLR on the African Great Lakes. Great Lakes. The Great Lakes of Africa. PBS. History of "African Great Lakes"
This page was last modified on 31 July 2017, at 15:04.